North Korea's criminal dictatorship routinely violates weapons and security agreements, so reports that dictator Kim Jong Un wants to "dialogue" with the U.S. and South Korea about his precious nuclear weapons warrant deep skepticism. However, Pyongyang's latest offer to hold "discussions about more discussions" may not be completely superficial. North Korea's rapid move from the Olympics' political theatrics to publicly acknowledging substantial issues and expressing a willingness to address them isn't decisive, but it is encouraging. 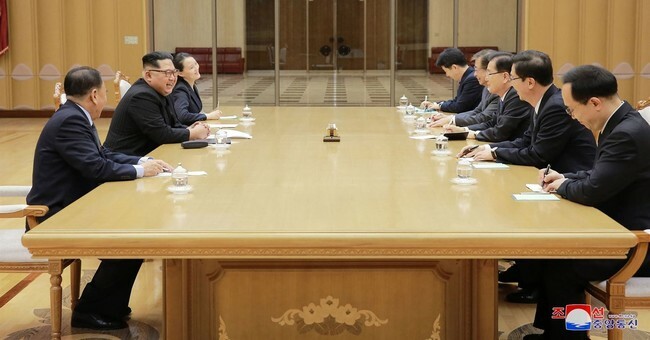 During a state banquet held in Pyongyang on March 5, Seoul's negotiating team and Kim himself reached a "satisfactory agreement" to hold a full-scale inter-Korean summit meeting that would include a face to face meeting between Kim Jong Un and South Korean President Moon Jae-in. The South Korean diplomatic delegation's trip to Pyongyang was the first high-level South Korean visit to the capital since 2007, when they met with Kim's father, Kim Jong Il. The banquet classifies as theatrics, but it was also the first time South Korean officials had talked openly and directly to the Kim Jong Un. North Korea also dropped its demand that South Korea and the U.S. cancel their joint military exercises scheduled for April. The South Korean delegation indicated Kim himself had said he understood the drills would proceed. North Korea had also agreed to suspend its provocative nuclear weapons tests and missile tests while talks continue. But here's the big news: Pyongyang's dialogue with the U.S. and South Korea would address two critical subjects, denuclearization and establishing formal diplomatic relations between them and North Korea. Denuclearization is Trump Administration short hand for America's strategic goal on the Korean peninsula -- no nuclear weapons in either the North or the South. The policy is well crafted. The U.S. and its democratic allies, South Korea and Japan, are not demanding regime change. North Korea's vicious regime can remain in place. Yes, North Korea's wretched citizens will continue to starve in a Stalinist gulag, but China will retain an authoritarian and semi-dependent buffer state between its border and South Korea. However, the Kim regime must get rid of its nuclear weapons and nuclear weapons manufacturing capabilities. Assuring that it no longer possesses the weapons and means to threaten Seoul, Tokyo, Honolulu and San Francisco with nuclear immolation will require a very intrusive, long-term verification regimen. The U.S. and its allies have backed the policy with "high pressure" coercive diplomacy featuring ever-harsher economic sanctions and very potent military "shows of force." The U.S. has also pressured China politically and economically. Beijing certainly heard President Donald Trump's recent calls for tariff hikes and his seeming disregard for the consequences of a trade war. I'm betting Trump's timing wasn't an accident. The U.S. has also threatened to stop sanctions violators on the high seas. Trump has also engaged "Little Rocket Man" Kim in bouts of name-calling. Trump belittled Kim, and did so with humor. Insulting a dictator's "dignity" is a potentially valuable act of psychological warfare. Dictators assert invulnerability by using physical threat to silence dissent. Kim's inability to stop or ignore Trump's taunts revealed a kind of vulnerability. Trump posted a tweet on March 6 that summarized developments since the end of February: "Possible progress being made in talks with North Korea. For the first time in many years, a serious effort is being made by all parties concerned. The World is watching and waiting! May be false hope, but the U.S. is ready to go hard in either direction!" The Kim regime has a record for duplicity. It could use negotiations to buy time to deploy a nuclear weapon deliverable by ICBM. It could reject the intrusive verification regimen assured compliance requires. However, the regime's March 2018 script has altered, if ever so slightly. Kim once said he would never give up his nuclear weapons. Now he says he'll discuss the possibility. Hard in either direction -- Trump is guaranteeing the pressure to achieve denuclearization will continue.